Making good decisions about your future can be a complex process. We hope this helpul guide will assist you as you plan and work through the decision process! What types of fees are associated with the move-in?Are pets allowed?Will I lose my independence if I move to Samaritan Village?Can I bring my own furniture when I move in?What am I going to do with all my belongings?How is Samaritan Village different from other communities?What kind of transportation services do you offer?What are the signs that Assisted Living may be the right option?How do I determine my budget? How old do I have to be to move in? Which lifestyle option is best for me or my loved one? What types of fees are associated with the move-in? Samaritan Village is not a buy-in community, so we do not require a large upfront fee to move into our community. We simply require a one-month security deposit or community fee and first month’s rent. We allow senior-friendly small cats or dogs under 30 pounds. Will I lose my independence if I move to Samaritan Village? Our residents have found they actually have more time and freedom once they made the move to Samaritan Village than they did when they were living in their own home. After all, there are no more worries about household chores or property maintenance, and bills are greatly simplified to one monthly rental fee. This leaves a lot more time and freedom to do what you want to do! Can I bring my own furniture when I move in? Absolutely. Each apartment is fully furnished by the resident and we encourage future residents to come in and measure rooms and consider how they want to decorate their new home. What am I going to do with all my belongings? Moving can be a challenge at any age. There are companies that specialize in helping seniors downsize and move who can assist with most if not all aspects of a move, including packing, labeling, and lining-up a moving company. Partnering with such a company can help make your move go much more smoothly. How is Samaritan Village different from other communities? Samaritan Village is unique in many ways. As the sole property of a non-profit organization's entire focus, our efforts are devoted to resident satisfaction on site. Founded through an endowment, Samaritan Village is graced with on-site amenities unlike most others. A community within a community, the uncommon camaraderie among our residents and staff make Samaritan Village an attractive place to live, work, and visit. For Independent Living and Residential Living, our bus driver provides transportation to and from doctor, dental, and shopping appointments four days a week to Modesto in the morning and Turlock in the afternoon. The fifth weekday is reserved for special outings. For Assisted Living, a part-time driver is available for medical appointments, but families are encouraged to assist with providing this transportation. What are the signs that Assisted Living may be the right option? There are certain indications that Assisted Living may be beneficial to an individual. For example, they may have health and safety needs that cannot be managed in a private home environment. An individual may be a candidate for Assisted Living if they require assistance with some activities of daily living like preparing meals, bathing, dressing, performing household chores, or if they are experiencing memory problems. They, along with family or trusted friends, can discuss any concerns that they may have with their medical doctor. Samaritan Village staff would be happy to provide a free assessment that would give you a better sense of whether Assisted Living is the right fit. Most of our residents began with a simple calculation of their current monthly expenses and cash flow and compared these expenses with the amenities included in their monthly rent at Samaritan Village. For a list of included amenities, please see our Amenities section. How old do I have to be to move in? 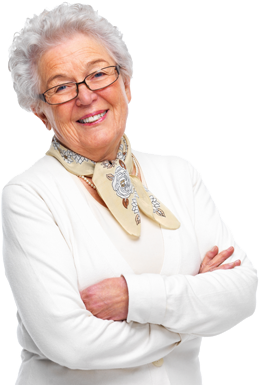 Our residents must be 62 or older to move into our senior retirement community. Which lifestyle option is best for me or my loved one? Independent Living is a great lifestyle choice for those individuals seeking the most independence and who require no assistance for their personal care needs. Residential Living is designed to accommodate individuals who might require future care services in their apartment home, which allows you to "age in place" successfully without necessarily having to transfer to our on-site Assisted Living facility. Our Residential Living options provide assisted care options which can assist you with most of the activities of daily living should you ever require more assistance. This option is intended for those who only require little to moderate personal assistance. Assisted Living might be the best choice for those who require moderate to maximum assistance. Candidates for Assisted Living include those who require increased assistance with activities of daily living and/or who are experiencing memory problems such as dementia. We would be happy to provide a consultation that would give you a better sense of which lifestyle option is the right fit.